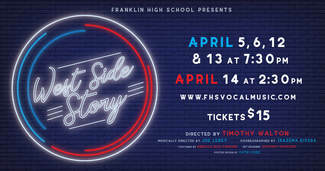 West Side Story is almost here (April 5,6,7 & 12,13). We are hoping each family can donate their time for at least one show and/or refreshments. 2. DONATE food/drink concession items. Snacks: POPCORN bags, Doritos, pretzels, chip assortments. All food & drinks are sold for $2.00. All money raised from refreshment sales goes to the CPA to support Choir Scholarships. Non-perishables can be dropped off in the Choir Room the week prior to the show - please be sure to label with your name and Into the Woods. If you would prefer to make a contribution toward the purchase of concession items you may put your money in a envelope labeled with your name & 'CONCESSIONS' into the gray CPA box outside of Mr. Walton's office before the first Friday show.